The Illinois Supreme Court today heard arguments over the constitutionality of a seventeen-year-old parental notification law that never went into effect because of a legal challenge brought immediately upon enactment. The case has bounced around the state’s courts ever since. In 1995 the Illinois legislature passed the “Parental Notice of Abortion Act,” which was so permissive that even the then-Governor, pro-abortion Jim Edgar, agreed to affix his signature. In June of that year, the ACLU quickly persuaded a federal judge to grant a restraining order just hours after Edgar had signed the measure into law. On Tuesday, February 21, House Bill 4085, the Ultrasound Opportunity Act, passed a House committee by a vote of 10 to 2. The bill now goes to the full House of Representatives for their consideration. We expect a vote in the next few weeks. This bill simply requires that a woman seeking an abortion, after 7 weeks gestation, be offered the opportunity to receive and view an ultrasound of her baby by the physician who is to perform the abortion, the referring physician, or another qualified person working in conjunction with either physician. Please contact your Illinois State Representative now and ask him or her to “vote YES on House Bill 4085, for informed consent and for the opportunity for women to see an utlrasound of their unborn babies.” If you do not know who your state representative is, you can look it up at www.ilga.gov and click on Legislator Lookup in the bottom right column. Thanks for all you do in support of life. An abortion industry special interest bill known as the Reproductive Health and Access Act was introduced in the Illinois General Assembly in both 2009 (HB 2354) and 2010 (HB 6205). Dubbed “Illinois FOCA” for its similarity to the federal Freedom of Choice Act, the bill would have repealed parental notice for minors undergoing abortions, introduced limits on liability for abortion providers who harm women, expanded taxpayer funding for abortion, and repealed conscience protections for healthcare professionals who do not wish to be complicit in the practice of abortion. ICE-PAC participated in a statewide effort to defeat this bill. We delivered this letter to every member of the Illinois General Assembly on March 18, 2009 as they began deliberations on the bill. Ultimately, in both the 2009 and 2010 legislative sessions, the bill was not called for a vote due to lack of support. During the campaign season leading up to the 2008 general elections, Francis Cardinal George, Archbishop of Chicago, issued this statement regarding the connection between social justice and the protection of life. Specifically, the Archbishop clarified that the abortion issue is central to Catholic Church teaching on a just social order. His words affirm the special importance of pro-life efforts among other issues of public policy. 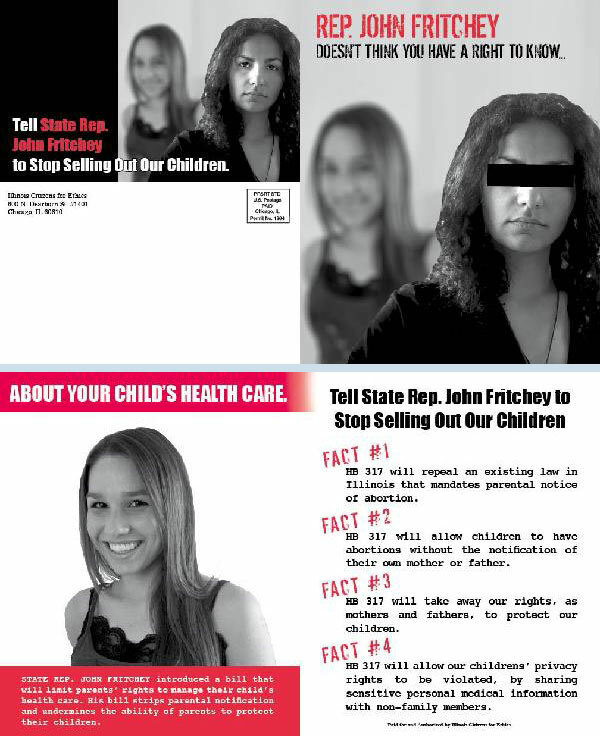 During the 2008 primary elections, State Representative Paul Froehlich came under attack from the pro-choice lobby for his pro-life stance on issues like parental notice and embryonic stem-cell research. On January 31, 2008, we submitted this letter to the Daily Herald rebutting these public attacks and supporting Representative Froehlich’s re-election. He won his primary, as well as a victory for pro-life values. Abortion is commonly thought of as primarily an issue for the U.S. Supreme Court, and many pro-life efforts focus on the goal of overturning the Roe v. Wade decision. However, until that goal is realized, there is much that pro-lifers can do to protect human life through their local governments. Specifically, the U.S. Supreme Court has recognized that states have the right to enact laws that limit and regulate the practice of abortion. In this focus article, Brian Hengesbaugh of the ICE-PAC Board of Directors explains why the time is right for Illinois to adopt these kinds of laws, and why the efforts of groups like ICE-PAC are worthwhile. ICE-PAC was closely involved with the effort to defeat House Bill 317 in the spring of 2007. This bill, if passed, would have repealed Illinois’ parental notice law for abortions performed on minors. On March 21, 2007, we sent a letter to all members of the General Assembly exposing the flaws in HB 317. In late April 2007, we sponsored telephone and direct-mail campaigns in critical districts to solidify the vote against HB317. Our flyer opposing the repeal of the Parental Notice of Abortion was mailed on March 23, 2007. The floor vote on HB 317 took place on April 26, 2007. We have recorded how all Illinois House members voted. A “yes” vote is a vote to repeal Parental Notice law, and a “no” vote is a vote to uphold it.